When working at a theme park health and safety concerns are paramount and one must always be acutely aware of potential danger. The parks tend to employ a lot of young people who can become rather distracted and wrapped up in the fun of it all. Those in a supervisory or management position must try to keep things running smoothly and safely. Various managerial techniques are employed but my own preference is for using a pterodactyl! You may well ask where I managed to find such a creature in the first place. 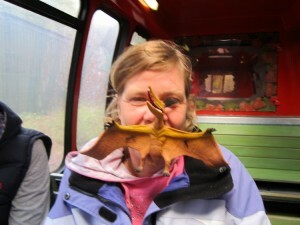 It is not every day that you stumble across a pterodactyl but you can find them at Alton Towers. When working at Thorpe Park I gained a reputation for unfortunate outbursts which my dear friends described as resembling the squawking of a prehistoric creature. When we visited Alton Towers for a fun day out one of my friends discovered a plastic pterodactyl in the souvenir shop which he purchased as a gift for me. He named my new companion Adolf which seemed like a slightly odd choice considering he is Jewish but hey! I was told in no uncertain terms that I must always carry Adolf with me when working on the rides. I thought this was a major inconvenience until I discovered a new role for him. I informed all of my colleagues that henceforth if I felt that people were not working properly I would wave Adolf at them as a sign that I was getting angry. Miraculously this tactic worked and many a major outburst was avoided by simply producing Adolf at the appropriate moment. Adolf ensured the smooth operation of the rides but must have left the guests wondering why there was a crazy woman at the controls waving a plastic dinosaur! My rather aggressive looking new friend produced many a laugh at the park and often left me with some explaining to do. I recall one day when security arrived at my ride to do a check of the staff. Every so often such checks would be undertaken to ensure nobody had taken mobile phones onto the ride as they were banned for safety reasons. When security arrived you were asked to turn out your pockets and to undergo a body frisk. The search of my person uncovered my car keys, some pens, a bit of loose change and Adolf. The security guard gave me a very strange look and asked with a commendably straight face what the pterodactyl was for. I explained his role in the management of the ride. The security guard nodded sagely and handed him back. I then had a terrible fit of the giggles in full view of the public. It wasn’t long before Adolf became quite the celebrity. He was always with me and proved to be an effective means of communicating my frustration. I can heartily recommend pterodactyls as a supervisory tool. Other figures are available but I have never encountered anything quite like Adolf. This entry was posted in Stories and tagged rides, roller coasters, theme park work, theme parks on November 12, 2013 by Sally.